Hi guys! Under the Satyr Moon is still in progress. I know it seems like it is taking forever, but I rather it get written decently than rush and have it be a pile of rubbish. 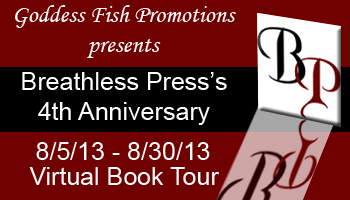 As a Breathless Press author I have a few appearances this summer as part of the BP’s 4th anniversary party. June 28 I will be at Shelli Rosewarne’s blog giving you five reasons why Satyrs make better supernatural boyfriends. June 29 Lee Brazil will be posting a guest blog here at my very own site! Woot! Welcome Lee! July 2 I will be visiting Lee Brazil’s blog to talk about the ways to piss off Dionysus. July 3 Shelli Rosewarne will be visiting me with a guest blog here. In August I have two appearances. One as Rebekah and one as myself. Previous postJoin me for a day at Bitten By Books!